Parents play a vital part in our school community! Here's a chance for you to get involved in a leadership position for next year's TAG Parent Teacher Association and help our school develop its tradition of academic excellence, social and academic enrichment, and community building. 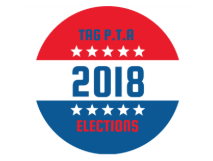 Participation on the PTA executive board is vital to shaping TAG into the best place possible for our children to be educated. All parents of TAG students (except TAG employees) are eligible to serve on the executive board. Term limits are two consecutive one year terms, starting July 1. Each office may be held by co-officers. At the June 19th meeting, all nominees will get a brief chance to address attendees before voting takes place. Only those attending the meeting will be able to vote for the executive board positions. Following elections for the executive board, attendees will also vote for one parent to fill an open position on the School Leadership Team, where a group of TAG administrators, teachers, and parents meets monthly throughout the academic year to set academic and social goals for the school. For any inquiries related to the election, please email Nominate4TAG@gmail.com.